QRS for BDS 3rd Year is an extremely exam-oriented book. 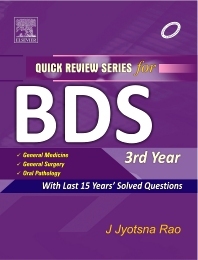 The book contains a collection of the last 10–15 years' solved questions of General Medicine, General Surgery, Oral Pathology and Microbiology in accordance with the new syllabus of BDS 3rd year. The book will serve the requirements of BDS 3rd year students to prepare for their examinations and help PG aspirants in quick review of important topics. It would also be helpful for PG students in a quick rush through the preclinical subjects.